Buy Natures Aid Raspberry Ketones 400mg - 60 capsules in the UK from our online shop or directly from our independent Scottish store. Raspberry Ketones 400mg with green tea provides 400mg of raspberry ketones. Raspberry Ketone is a naturally occurring phenolic compound found in red raspberries. 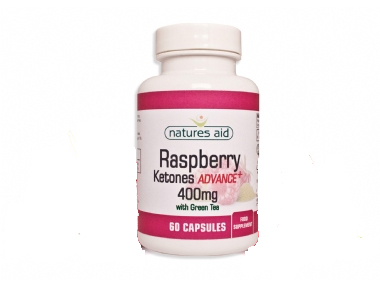 Natures Aid Raspberry Ketone Advance+ provides 400mg of raspberry ketones and 35mg of added green tea to provide optimum polyphenol levels. Take 2 capsules per day with water before meals. Do not exceed the recommended intake. Where can you buy real Raspberry Ketones 400mg 60 caps safely online? If you are wondering where you can buy Natures Aid Raspberry Ketones 400mg - 60 capsules safely online in the UK, then shop with us. Raspberry Ketones 400mg 60 caps - Natures Aid Raspberry Ketones 400mg - 60 capsules in Green Foods and Weight Management and Herbal Remedies, Tinctures & Supplements.